Q: Does Vivid Reports Flex modify, change or write data back to the ERP / Accounting system? A: No. Vivid Reports Flex does not require you to change your ERP or databases in any way for it to work. Vivid Reports Flex is a “read only” system. Q: How long does it take to install Vivid Reports Flex? A: Five minutes to install the client (Excel add-in) and another five minutes to configure each data connection you want to use. Q: How long does it take to learn Vivid Reports Flex? A: If you’re comfortable with Excel and know your way around the databases you are accessing you can begin creating reports in a matter of minutes. Training is an option but most of our customers find the videos and documentation adequate to learn Flex. Q: How does your pricing / licensing work? A: Vivid Reports Flex uses a Named User licensing model. Licenses can switched over to another user at any time. There are two types of user licenses which are a consumer license and an administrator / designer license. Q: How do you prevent someone from accessing information they should not be able to see? A: There are many ways to accomplish this in Vivid Reports Flex. You can control what connections and data sources each user can access. You can build restrictions directly into the dynamic reports you distribute or you can provide static reports that only contain the information someone will need. Vivid Reports Flex also allows you to control functionally what a user can do so you can take capabilities away such as the ability to edit a report definition. Q: Can Vivid Reports Flex access non-financial information? A: Yes. Vivid Reports Flex can access any information in any ODBC-compliant database. You can create reports against any table or type of information. For example, Vivid Reports Flex can produce reports related to production volumes, staffing requirements and any other metric or statistic. Q: Can Vivid Reports Flex completely replace Microsoft FRx? 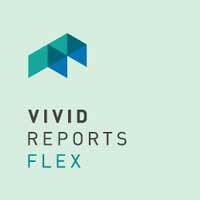 A: Vivid Reports Flex is a generic reporting system that can produce a multitude of reports from any ODBC-compliant data source. However, for financial reporting, budgeting and forecasting, we suggest you use our Vivid Reports CPM software solution, which has been built specifically for this special type of reporting. Vivid Reports CPM is a complete replacement for FRx. Q: Does Vivid Reports Flex use a Data Warehouse? A: No. Vivid Reports Flex uses a live data connection to connect Excel directly to your databases. Q: Can Vivid Reports Flex be deployed with Citrix or Terminal Services? Q: Do you need a license to view a report created with Vivid Reports Flex? A: No. Vivid Reports are 100% normal Excel files. Anyone with an Excel license can open and view reports created in Vivid Reports Flex. A license is only required when you need Vivid Reports functionality such as dynamically refreshing a report, linking to other reports or distributing reports to other users through report automation. A: We have a very secure and proprietary way of integrating with Excel. We treat Excel like a browser for your reports and information. Reports and analysis generate very quickly and this allows the users to select what they want to view or analyze. We also have an automation tool (available at no extra charge) that allows users to distribute reports to other users or recipients, printers (PDF), folders, Sharepoint or email. Reports can be opened by anyone with or without a Vivid Reports Flex license. Vivid Reports Flex named users can also access and navigate reports through our report linking feature. A: ERP stands for Enterprise Resource Planning and includes such systems as Microsoft Dynamics, Epicor, or SAGE. Vivid Reports Flex integrates with your ERP as well as other ODBC data sources to provide enhanced reporting, KPI, and analysis.